Note: This module is for Drupal 5. I have not tested it in Drupal 6. Note 2: I will not provide support for this plugin. If you run into any trouble, you are on your own. Upload the module to sites/all/modules folder of Drupal. Edit the node.tpl.php template file and insert the code <?php print $page_ad ?> where you want the block to show up. Edit the template.php file and add the code 'page_ad' => t('Page Specific Ad') in the returning array for the regions function. 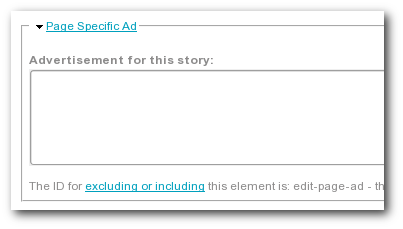 Go to the block configuration page and set the ‘Page Specific Ad’ block with the ‘Page Specific Ad’ region. This is a plugin that I created to learn a bit about Drupal. I did this quite a while ago. It may have a lot of error – because I’m not an expert in Drupal. I don’t use it much.